My husband was letting the dog out tonight December 31st, 2011 when he noticed a very bright orange, yellow light over Oshawa, Ontario. It slowly moving sideways, zigzagging. He called me and I saw it. It was much bigger than a plane would be. It faded to dull red as it moved southwest and disappeared behind a cloud. The whole sky has an orange hue to the clouds tonight. It is New Years eve and was sighted at about 8:25 p.m. I was on the phone with my daughter and told her to look out, and she saw it just as it was getting smaller then disappearing . Please let me know if anyone else saw what we saw. It was strange. Thanks. Bright orange yellow ball over Oshawa, Ontario tonight at 8:25. Amazing and weird, moving slowly across sky side to side then fading to light red and decreasing in size and disappeared behind clouds. December 31, 2011. Hi Brian, sorry it took me a bit to send this to you. Been very busy with Christmas. I don’t remember the exact date, but it was in July 1990. I know the years because it happened 1 month before our wedding. We were at our nieces christening and ended up staying until about 10:00 p.m. The highway we took is highway 20. We were in St. Anne’s heading home to St. Catharines about a 40 minute ride. At night there’s never allot of traffic. There were no cars behind us, no cars in front of us and no cars coming towards us. All of a sudden we saw what looked like a bright red tube with swirling fire. My husband said he thought we were coming up to a curve and it would probably be a house. For 20 minutes we were following it. There was no bend in the road. My fiancé sped up to try to catch up to it to get a better look, but we could not get closer (I should mention the swirling looked like it was just a foot or so above the road) after about 20 minute it just disappeared and we have no idea where it went. I’m sure we would have seen it go up into the sky or into the fields on either side, but it was just gone. When it disappeared like that, we got really scared and my fiancé sped up just to get us off the highway ASAP. To this day we will not use highway 20 after dark. About 6 months after I had read a article in our local paper a guy wanting to know if anyone had any UFO stories, so I called him and told him what I just wrote to you. Few days later he called me back to tell me that we were not the only ones to see it. Take Care. We live just outside Cambridge, Ontario and my son and I saw the exact same thing at the exact same time. We reported it to the American Meteor Society and they explained that it must have been Chinese Lanterns which is BS, as it was a perfectly calm night. Coincidentally there were numerous reports of a huge fireball that "exploded" and "fragmented" over Texas and was observed in Mississippi, Missouri, Ohio and Pennsylvania all around the same time and heading in a general north to south direction. I believe what we observed were the blazing fragments of the object the entered the atmosphere over the southern states and broke apart. Hi Brian, this is really strange, but I was just speaking with my wife's uncle this evening. We were discussing what time Saint John is having their fireworks tomorrow night. He told me they haven't been uptown since December 31, 2009, then proceeded to tell me about these three amber/orange lights him and his wife saw that night. They came from the direction of Rothesay and travelled east extremely fast. When I came home I Googled what he told me just to see if there were any posts. Very odd indeed. Take care. The Vike Factor Note: Over the years that I have been investigating UFO sightings, I have always received many reports of unknown objects that zig zag through the sky and making some wild maneuvers. But I have never been able to see what the witnesses were able to observe, until today. This footage is really amazing to watch. When watching this video clip, please keep in mind that one of the white lights/object is a star. The other “thing” that does some amazing moves, is unknown. Also, the person who sent the report and footage to me, I have known for sometime and has provided some other clips of objects that were really interesting as well. Hello, last night I was watching the stars and enjoying a cigar on my 6th floor balcony in Vancouver, B.C. A helicopter got my attention as it had a search light on near English Bay beach, so I got my Hi 8 video camera out and shot a bit. a higher orbit and disappeared. I am now going to try to get, the video copied onto a file that I can e-mail and burn a DVD of. The sighting is about 10 seconds in length and quite clear. It now makes me wonder about some of the other "satellites" I have seen that seem to vanish or grow very dim. I used to just take it for granted, that it was the satellite losing sunlight to reflect. At about 930 pm I was at 176 and 60th avenue with my son on Thursday December 22, 2011. We where heading back home going down 60 avenue to 168 avenue from 176 street. 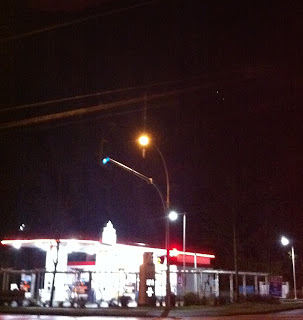 When we got to 60 avenue and 169 street, we noticed a bunch of light up in the sky above the area where our house is. I pulled my cell phone out and tried to capture what was happening. There seemed to be about 24 lights in the sky a few to the left around highway 10 and bunch straight down 60 avenue and a few above and around 61 avenue. Some seemed to be moving and fading away, the rest just faded away, but did not seem to be moving. There was some fog or cloud in the sky which took away some of the light. Some of the lights were spaced out in different areas of the sky. My cell phone did not pick up some of the lights that were in the sky, and also did not pick up my sons voice. Also the lights appeared white in the video, but some of the lights where orange, white color. I was holding the cell phone in my left hand near the drivers window with the window down and my hand outside the window. The bottom shows the street lights as well as the sign from the corner stores at 168 and 60 avenue. I am not sure what it was, but there was lots of them in the sky. I posted the video on YouTube with the below title: Cloverdale BC-strange lights in sky Dec 22, 2011 or visit the link below. Take a look and please and let me know if you find any more information about what happed that night. Yesterday, December, 29, 2011. At an estimated time of about 9:30 p.m. to 10:00 p.m. I witnessed several moving bright lights in the sky, they were too small to be any type of aircraft and couldn't be stars because they were moving at a fast pace. It lasted about 20 minutes. They all suddenly disappeared after that. I tried to get several pictures however they were too far away and it was too dark to capture any clear type of picture. Tonight at 10:30 p.m. local time in Lethbridge, AB I saw a similar object flying from the NW to SE direction over the city. No lights on the vessel is what gave it away. It was that it is a very clear night over the city and it was a wide V shaped object, brownish in tone compared to black night sky. I could mark it’s passage as it blotted out one star to the next. It was very large and silent. Although I could not tell the exact distance to this craft, and if it had been a plane causing a silhouette of that size, I would have most certainly would have heard it above the city noise. The Vike Factor Note: I have tried to reply to the witness over the sighting report, but having problems reaching them. Hi, Please note: Thought I would send this video taken from my phone on Tuesday, December 26, 2011 at approximately 1:40 a.m. Regards. Shape of Objects: Looked identical to a star. Full Description of Event/Sighting: This is the 3rd odd sighting I seen the Summer of 2010 in the same general area. Me and a bunch of friends were at the beach and had made a fire. I was over by my car with a friend while he was getting something. I was looking up at the sky as it was a very clear night. I then noticed that one of the stars seemed to be slightly moving. After watching it a few more seconds, I realized that indeed what looked like a star, was wobbling around in no general direction, but kind of all around in a small general area. It was moving around somewhat slow. I told my buddy to look up and tried pointing it out, and by the time he was able to locate it, it had stopped wobbling around and was now moving upwards in a straight, more faster speed, until it faded out of sight. Back in 1976-77 I was driving down QEW from Beamsville, Ontario to St. Catharines when I and a friend saw what we thought was the Good Year blimp in the sky over lake Ontario. As we got closer we could see that it was a huge cigar shaped cloud that was lit up from within with yellow/orange light. There were no other clouds in the sky that evening. It was approximately midnight. The object appeared to be about 500 feet in length and about 500 feet in the air and defiantly a shaped cloud very solid in form. Years later I related this story to a co-worker from Hamilton, Ontario who gave me the exact date because he was sitting up on the mountain in Hamilton, Ontario with his fiancé overlooking Lake Ontario. They were to be married the next day that is why he could remember the exact date and time. I think June. He said it was around 1:00 a.m. and this cigar shaped lit up cloud came floating over the lake from St. Catharines, Ontario. At the tine we left Beamsville while getting into the car I saw a white shaft of light with a red arrowhead like a neon light appear momentarily in the night sky. I started to say look at that, and it disappeared. 20 minutes later we encountered the Blimp shaped solid cloud over the lake. Number of Objects: I saw 6 but my neighbors saw 10. Full Description of Event/Sighting: I was out for a run and was heading west on 61A Ave., from 176th Street when I saw 2 orange lights west and a bit south of me. I couldn't always see them as I ran because there were tall trees blocking my view. When I ran onto 60th Ave., and turned north onto 171A Street I could then see 6 orange lights still to the west of my position. They were mostly stationary, but moving a little bit. When the lights moved they didn't move all at the same time, they were kind of meandering around. I had stopped to watch where a couple of my neighbors were also watching. They told me they had originally seen 10 lights all in a straight line streak across the sky from north to south ("faster than you could shoot a bullet") and then stop in their current position. The lights were just below a thin cloud cover and were maybe about 1/8th the size of the moon. As we watched the lights started to fade away one at a time. I decided to run home and get my camcorder and tell my family about the lights. By the time I got home there was only one light left (which my son saw) and by the time I brought out my camcorder that last light had faded away. From my first sighting until the last light disappeared was about 10 minutes. Time: Between 9:30 p.m. - 10:30 p.m.
Hi Brian, last night, December 26, 2011 my family and I saw these same fire like, circular objects. At first we saw 2, and then out of nowhere, a third. They had a set path, heading and eventually fading into the northern sky. This all happened between 9:30- 10:30 pm. I became fascinated with what we first saw, and spent an hour watching the sky. In all I saw 11 of these objects all headed from south to north in Sherwood Park, Alberta. Shape of Objects: Orange lights. Full Description of Event/Sighting: 3 orange lights appeared to be traveling from the Brantford Airport, they traveled east in an isosceles triangular formation. They were silent, and after approximately 30 seconds a fourth light was spotted. I saw them too. I was driving home December 24, 2011 at 11:30, heading north on 184th in Surrey at Fraser Hwy, B.C. I got out of my car, I noticed 3 bright orange lights in the distant east heading towards me. They got larger as they came closer. Glowing orange, just below cloud cover, I could see what looked like lights circling the object, by the reflection in the clouds. The size was about a dime in diameter, if you put your pointer finger and thumb together and hold it to the sky, if this makes sense. They headed west and faded out. We were in the car on our way home Christmas Eve, time was 9:15 p.m. ish. We saw (what we thought was 3, but turned out to be 4) orange lights basically in a line. There was no sound. We sat and watched for a minute and then they just disappeared. I snapped a picture, but all you can see is the pinpoints of where they were in the sky, nothing like the naked eye. We're in Belleville, ON. Hi Brian, I live in Corner Brook Newfoundland and last night, December 25, 2011, I witnessed 4 bright orange lights in the sky which seemed to be similar to what you saw in the sky in Edmonton the night before. These lights were in a box shaped formation and then slowly change to other formations and eventually moved to a stacked vertical formation. After they moved to a vertical position, they faded off. My husband, brother and I watched the lights for at least 15 minutes. My brother is a pilot and he knew they weren't lights from an airplane. Even though they were changing formations they hovered in the same location for that time period. I called the RCMP immediately to report the sighting of the lights, but they said up to that point no one else had called. I then checked the internet for bright oranges lights in the sky and came upon your blog. Time: Around 1:00 a.m. - 2:00 a.m. Shape of Objects: Pulsing object. Full Description of Event/Sighting: This is the 2nd odd sighting I seen in the Summer of 2010, in the same area. Me and a buddy had driven down to Green Bay. We ironically were talking about what we had seen in the same area a few weeks earlier, standing outside having a smoke. Suddenly to our south, over the Atlantic ocean, was an extremely bright, pulsing, light. It was much bigger then a star, and it was incredibly bright, seeming to somewhat change shape slightly as it pulsed. The light was white. The object did not move at all, and looked to be far away and a few hundred feet over the ocean. It was odd because it seemed far away, yet the light it was emitting somehow seemed close. There was no noise at all. After about 20 - 30 seconds the object seemed to shrivel up to the size, and lighting, of a large star, and then start moving towards the west maybe southwest. Was amazed, and my friend was terrified. Me and my friend concluded that the object seemed to be doing some sort of refueling or power charging when we first seen it when it was stationary, and then after half a minute or so was then able to fly up away from the earth. Shape of Objects: Large circular. Full Description of Event/Sighting: This was the 4th odd sighting in the Summer of 2010 from the same area. Me and 4 buddies were at the beach. Me and one of the guys decided to play a joke on the other two, and were hiding in the beach grass. Suddenly my buddy wacked me on the arm and pointed up and said look. I couldn’t believe what I was seeing. Coming from the south (over the Atlantic ocean), and headed north, was a very large, circular, glowing a deep, dark, reddish color, object. I could see a long trail of what looked like smoke behind the object, and I totally thought it was a meteorite, asteroid, or comet that had entered our atmosphere (hence the smoke trail). But as it flew directly over us, I was amazed by how large, and low, the object was. Because we could see it coming for quite a ways, and then watched it head north for even longer. I realized that whatever it was, was very low and close to earth. The odd thing was that as large and as low as the object seemed, it also moved very slow, and made completely no noise. The smoke-like trail was incredibly long, and basically stretched across the whole sky. I could not believe that I could not find any other reports of what me and my friends had seen in the Summer of 2010 in the Crescent Beach area. I’m hoping that someone else have seen similar things. Hi, there were four of us who also saw the same lights earlier around 6:30 p.m. and saw two groups of three. The first group, the lead light faded and the third light accelerated very fast caught the second and disappeared. The second group the third light faded first and then the other two. Spotted around 148th and 32nd Ave., Surrey, B.C. 2 reddish-orange orbs that resembled flames on a small candle flew in a southwestern direction below clouds. They appeared to flutter like a candle in a breeze. No noise. When the two disappeared, into what appeared to be the clouds a third similar orb in a similar trajectory repeated a similar action. After checking local weather it appears these light were below a ceiling of only 300 feet above ground. And there was light snow at the time. I would have loved to have gotten a picture, but only had IPhone with me. Would not have captured the light. Please let me know if you hear anything else or I guess I could just check back. Regards. Hello, I just came across your blog where it talked about the 3 orange lights in the sky last night. I was driving home with two others and we noticed it as well. We pulled over to watch it. 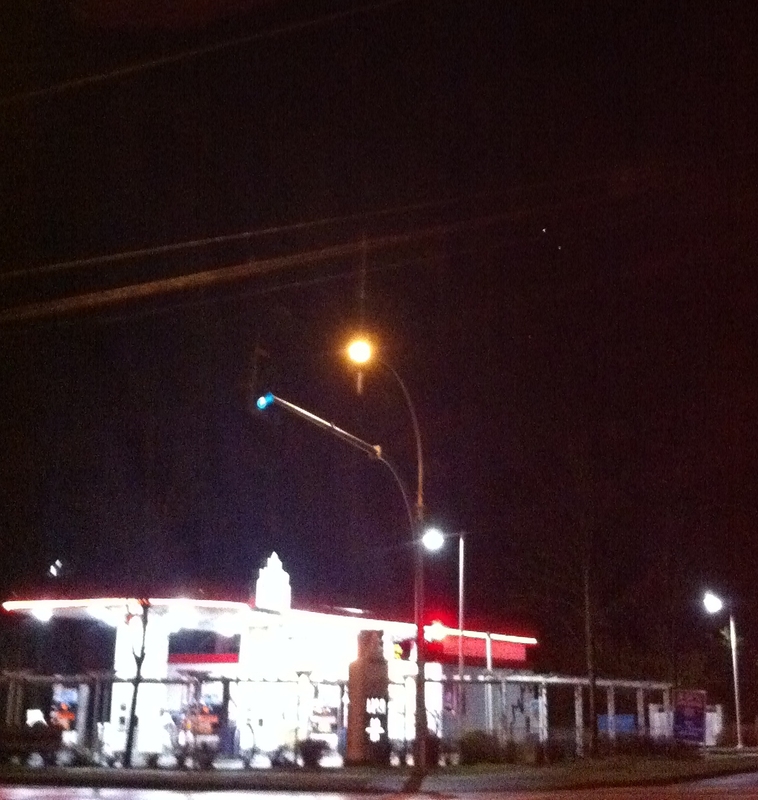 We were around 184th and 64th Ave in Surrey, BC around 11:30 pm (December 24, 2011). The lights were north of us. There were three bright lights which were orange-ish/red and they were travelling completely at the same speed until they each faded out (one at a time) and then disappeared. Their colors appeared to change as they went across the sky, from red to orange and white. I did get a photo (attached). To the right of the bright street lamp you can see two bright lights in the sky (looks white in the photo) and directly below it you can see the third which was starting to fade. Thanks. Shape of Objects: Looked like a large star. Full Description of Event/Sighting: This was the first of 4 odd sightings in the same area over the same summer. Me and a buddy were sitting in my car at Crescent Beach, facing the Atlantic Ocean (south). The moon was in front of us a little to the left, and that really bright star (some call it planet X) was a slight bit below the moon and also to the left of the moon. All of a sudden we seen this object, which looked like a large, bright star, came from the area of the original big star (planet X), in a very straight, sharp angle directly towards the earth to our further left. The object was going northeast from the moon area. The object was slightly larger and brighter then the bright planet or star it seemed to have come from. It seemed much too large, consistent, and slow to be a shooting star, yet also seemed much too fast to be a satellite. It was traveling at such a speed and direction that I had a sense of worry as to what might happen when this object hits earth. Then, just before it was about to hit the earth, it seemed to almost stop, and then shoot back up at a much smaller angle and away from us, towards the east, until it faded out of sight. Hi, I'm (name removed), I live in South Surrey in the blueberry fields. Around 5:50 p.m. on December 24, 2011 I saw two triangular formations in the sky. orange spotted lights were flying. The first one was on the west side of the sky and disappeared after 25 seconds after I saw it. I had enough time to grab my camera and capture the second group of triangles on the east side of the sky forming a perfect triangle. I recorded probably 30 seconds of the triangle shaped lights. There were no sounds and it was super quiet. When the second formation disappeared, I saw a plane fly across the sky from west to east, and then there was nothing. The video is too large to attach to an email. Any more info you have about it, I would be interested in hearing about it. In South Surrey there's just a specific spot in South Surrey where all the blueberry farms are located, but I guess you are not from around here so it is kind of useless information. It was in the farm area of south Surrey, British Columbia. The formation disappeared after about 25 seconds when I saw it. The lights were an orange colour. I will attach a screen shot of the video right when the lights were at their brightest in a perfect triangle. In the video they kind of all simultaneously moved together closer at the same time and stopped perfectly in the position of the picture I am sending you. They were in a bigger triangle then kind of moved and stopped together at the same time to perfectly form a smaller triangle. Saw 3 of them at that time from 167 Street and 97 Avenue and I couldn’t figure it out. It looked like one dropped a flare at one point. In Edmonton and they were heading north at what looked like a slow pace. Their formation was triangular although random and not fixed. They slowly disappeared as their distance progressed. I pretty much saw the same thing around the same time. I was in a park, at the time, and saw 4 objects going by in twin formation. To me they were more a bright orange-red in color. I did not see twinkling or flickering. The light was pretty steady and all four appeared to fade out at the same point in the sky. Their speed appeared to be steady and quick. At first I though them to be balloons that were sent up by someone local but then realized I did not see any flickering, plus the speed they had was steady, as was the light being given off. Also, there was not a sound as they passed by and at the speed they were travelling there should have been some sort of noise. The sky was somewhat overcast and they were below the cover. About a half hour later the sky appeared brighter to me and a somewhat orange colour the want back to being darker then no overcast for about an hour around 1:00 a.m. Anyway - it was a nice Christmas Gift. Around 7:30 p.m. I saw 5 bright orange lights heading north. Three started out together, somewhat traveling together. Two more followed later, my mother (in another location) also saw the three traveling together. Number of Objects: 3 – 4. Full Description of Event/Sighting: After opening presents on Christmas Eve, our family went out to walk the dog in our neighborhood. My wife suddenly noticed at least three very bright lights in the sky. The entire family stared at them as moved slowly in formation with one or two in front, and two traveling together behind, toward the east, north of Guelph. The lights were large and bright, yellow/orange in colour and seemed to flicker like candles, they were unlike anything we had ever seen before. The strangest part was that they were all traveling together, had no typical flashing red/green aircraft lights, and made no sound even though they seemed to be close by. I'm just wondering if these lights were seen by anyone else that night. Number of Objects: 2 groups of 3 orange bright lights in triangle formation. Shape of Objects: Triangle Formation. Full Description of Event/Sighting: A group of three orange bright coloured lights flew from east to west then shortly after another group of three bright coloured lights followed. One of the first three orange lights disappeared shortly after. The lights were in a perfect triangular formation with a straight path. About 5 minutes ago I saw what appeared o be a pair of orange lights, one following the other headed north. While the first "pair" were still in view another pair came into my view (from house window facing east). They headed at speed that a small prop plane would go, and at about that height and then disappeared into cloud cover. I could make out no plane lights. Looked almost like glowing darkish, orange balloons, but clearly from movement they were not just balloon's floating along. Just saw those exact lights over Edmonton (Riverbend) right now. Four lights in a long row from South to North, headed North. Wild. While driving east from North Battleford tonight, December 23rd around 8:10 I heard a loud whistling noise, looking around quickly a large green light passed overhead of my vehicle fairly close heading in a south east direction. This object looked the size of a large garbage bag, but very bright green and traveling at an extreme fast speed, within seconds in vanished, but I thought for sure it would crash in the field within a few hundred meters from me. The light went away fast and this is why I was sure it crashed very close to me, although I could hear nothing or see nothing, very dark out at this time. Very scary considering the noise and the fact that it would have taken me out in a heart beat if it was a bit lower. Any other sightings of this? I have seen this but it was in the central interior of British Columbia, Canada in May 2003. Shape of Objects: Hard to tell, sort of a cylinder shape? Full Description of Event/Sighting: I pulled into our driveway and right before I opened our gate, I for some reason looked up in the sky and to the left of my driveway there were 3 orange type lights. At first I thought it was kids setting paper bags on fire and somehow making them float, but the movements were so strange. Two of them would stay together while the third moved away. Then the third would come back and the other two would separate. I watched this activity for about 6 minutes or so and then all three of them went into different directions. Two disappeared and I could see one hovering way beyond and then it disappeared. I really did not think much of this, until I saw what you had written. Hope this helps. I saw those same orbs in May of this year, and I'm in Oshawa. You're not crazy, unless I am too! saw exact same craft over Montreal Quebec, Canada in July 2007. Moving, slowly in a straight line west bound. The object was totally silent and not so noticeable against a blue sky background. No mistake about it, however it was a clear day and I watched it for a good minute. I saw the same thing in the mid 1960's. It was the size of a house or bigger flying parallel to the ground. I was about 9 or 10 at the time in Waterford, Ontario. It was a ball of fire. Years later the TV show hosted by "Robert Stack", "Unsolved Mysteries" profiled the same sighting. I'd like to know were more information can be found on this "Meteor". My partner and I live on Ponderosa Drive here in Peachland, B.C., overlooking the lake. On March 8, 2008 we were sitting in the hot tub and noticed a disk shape of red and white lights, we at first figured it was the tower up thereon the mountain, curious, we got out and stood on the deck we saw the tower, and watched for over an hour as it hovered. It was rather large very close. Eventually it flew up higher and moved over to the right above the little island there, and flew away. Also that night we seen a abnormally bright white light kind of almond shaped go across the sky, it was flying about as fast as what a jet would go, but we know it wasn't. After that we sat and watched the sky, and I know this sounds crazy, but around 5:00 a.m. in the morning we saw so many almost like stars move erratically through the sky we seen three fly away from one another in a triangle shape, and 2 almost what it looked like missed one another. I know this sounds probably like someone being an idiot on here, but I assure you we seen these things in the sky, they were not satellites. Anyone else see anything? I saw those lights as well, from UBC Campus in Point Grey. They stayed in the sky for the entire hour. I was outside, not moving or anything. Quite strange indeed.